Left to right: Kyra Miller, Danny Rothman, Jonah Broscow. Photo courtesy Kevin Berne and TheatreWorks. Rags, according to its bookwriter Joseph Stein, is in part a follow-up to his previous work, the legendary Fiddler On The Roof. Both concern questions of Jewish identity and faith; however, while Fiddler was about life in the Eastern European shtetl, Rags takes place in America among a community of recently arrived Jewish immigrants. Combined with a score by Charles Strouse (Bye Bye Birdie, Annie) and lyrics by Stephen Schwartz (Wicked, Pippin), Rags is a work both emotionally provoking and immensely entertaining. Theatreworks’ production of Rags, directed by Robert Kelley, is an excellent opportunity to see a rarely produced Broadway gem. The plot of Rags follows several groups of new immigrants scraping out a living on the streets of New York City in the 1910s. The main characters – if the play could be said to have them – are Rebecca Hershkowitz (Kyra Miller) and her son David (Jonah Broscow). Miller’s performance as Rebecca is outstanding. Despite exhibiting justifiable caution toward the new customs and dangers of the United States, she lowers her guard. Miller’s songs communicate her fear and insecurity, but are also beautiful to listen to thanks to her clear, powerful voice. Meanwhile, Broscow’s enthusiasm contrasts with his mother’s defensiveness, as he absorbs both the customs of his new country and the Socialist philosophy of the disaffected adults around him. Multiple excellent performances round out the show. Julie Benko and Donald Corren play daughter-and-father pair Bella and Avram Cohen – Benko deftly navigates one of the most complex characters in the play, while Corren’s acting spans the gamut between goofy comic relief and intense pain. Saul (Danny Rothman) helps Rebecca and David adjust to life in New York while also pushing Rebecca to join a union. But far from being a perfect symbol of workers’ rights, Saul makes numerous mistakes that harm his loved ones. Rothman’s intensity in his commitment is balanced by genuine remorse for his errors. The technical work is interesting without being overwhelmingly flashy. Set designer Joe Ragey creates a pent-in feeling with numerous tall structures combined with a projected backdrop that takes us from Ellis Island to the nicest parts of Manhattan. Pamila Z. Gray’s lights are often diffused through stage fog, adding to the sense of New York’s grimy industrial cityscape. Combined with Fumiko Bielefeldt’s down-to-earth costumes, the audience is drawn into the setting while focusing more on characters’ interactions rather than the surrounding stage. Immigration and America’s national identity are complex topics addressed by some of the greatest modern plays. 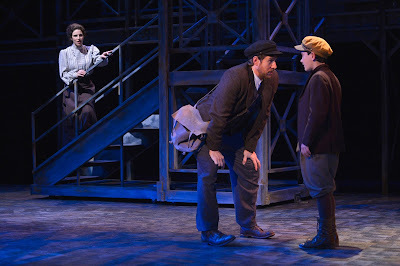 Rags at Theatreworks adds another voice to the conversation, drawing together the perils of new immigrants – especially at the turn of the 20th century – with the questions of Jewish peoplehood and assimilation also featured in Fiddler On The Roof. More than just pure entertainment, Rags lends perspective to a multi-faceted subject.